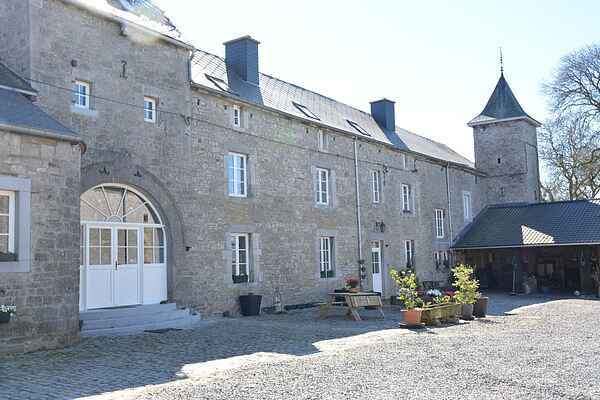 In the heart of Condroz, right at the end of a small country road, this superb 17th century property is built in a majestic style, no neighbours, with a huge outer wall from the period. All around there are only fields, valleys and pastures. The castle annexe was, very tastefully, turned into a cottage in 2016, and looks out onto a large courtyard, opposite still operational stables. When you enjoy a good barbecue on your terrace, you will then have about fifteen horses as neighbours! The kitchen is perfectly equipped and very bright. An open fire overlooks the dining room on one side and the living room on the other. The four bedrooms have been furnished with lots of care, and also the two bathrooms. All the beds are made upon arrival, and bath towels provided. This haven of peace is the perfect base camp for going on beautiful walks, both on foot and by bike: the owner will give you the itinerary for 7 great walks to Ouffet itself. You are between Durbuy and Comblain-au-pont, and you can thus easily enjoy all the activities offered by this beautiful region (golf, kayaking, excursions...). On request, the owners can provide horse riding lessons and / or give you the opportunity to go horseback riding.